Skills and Abilities: Competent strategist and prodigious fighter in armed and unarmed combat. Also skilled in the use of a machete. Powers: Superhuman strength and endurance. The brother of David Zavimbe/Batwing. As children after their parents died of AIDS they became child soldiers under general Kieta. Along with David he was revered as one of the most naturally gifted soldiers the continent had ever seen. He found himself on the verge of death when him and his brother refused to kill innocent people. Issac was scared, mortally wounded and found himself thrown from a cliff. Miraculously he survived. In the Jungle he regained his strength and became almost feral. Found by Josiah Kone he was nursed back to health and trained to hunt down and kill those who had betrayed Africa, the Kingdom. 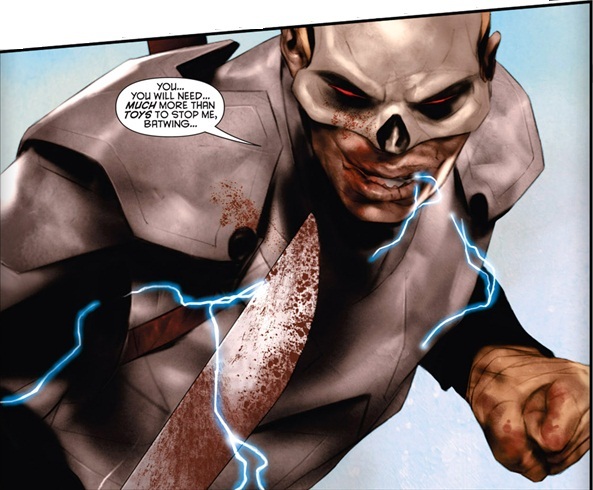 When he finally started his campaign of death he ran into Batwing and was thus his very first villain. He was responsible for the deaths and mutilations of many including the police station in which Batwing worked. In his bid to seek revenge for Africa and hunting the Kingdom, he managed to kill Earth Strike, Dawn Fire, Razor Wire, Thunder Fall and Staff. In Gotham city he as finally de-masked and defeated by the Batman family though he escaped in the ensuing explosion.